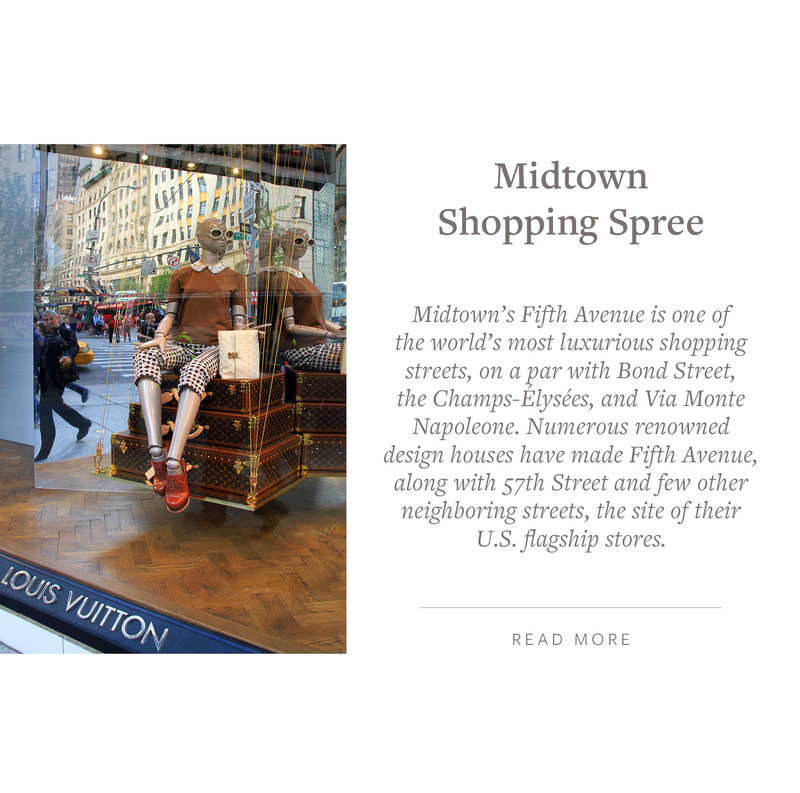 This month’s Culturally Inclined focuses on Central Midtown. During this transformative period the city lights up and prepares for the holiday season. 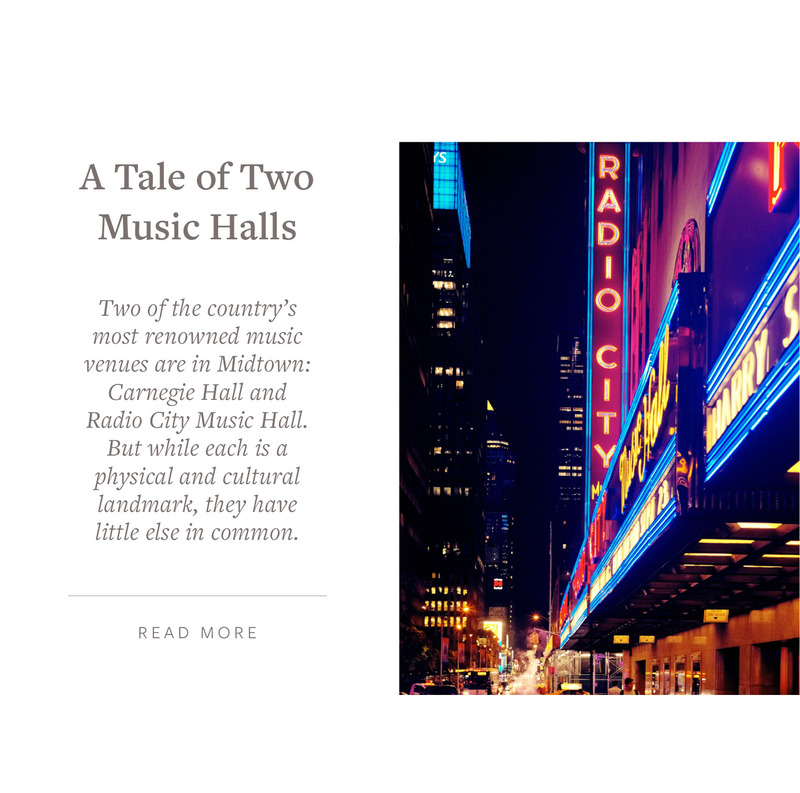 A perfect time to explore the area and it’s hidden treasures: the history of Times Square | Radio City Music Hall | Carnegie Park, prized steak houses, shopping, art museums and galleries including NYC’s new Archaeological Repository: The Nan A. Rothschild Center, art deco and landmark buildings that are master pieces, indoor pools, local market report and so much more. 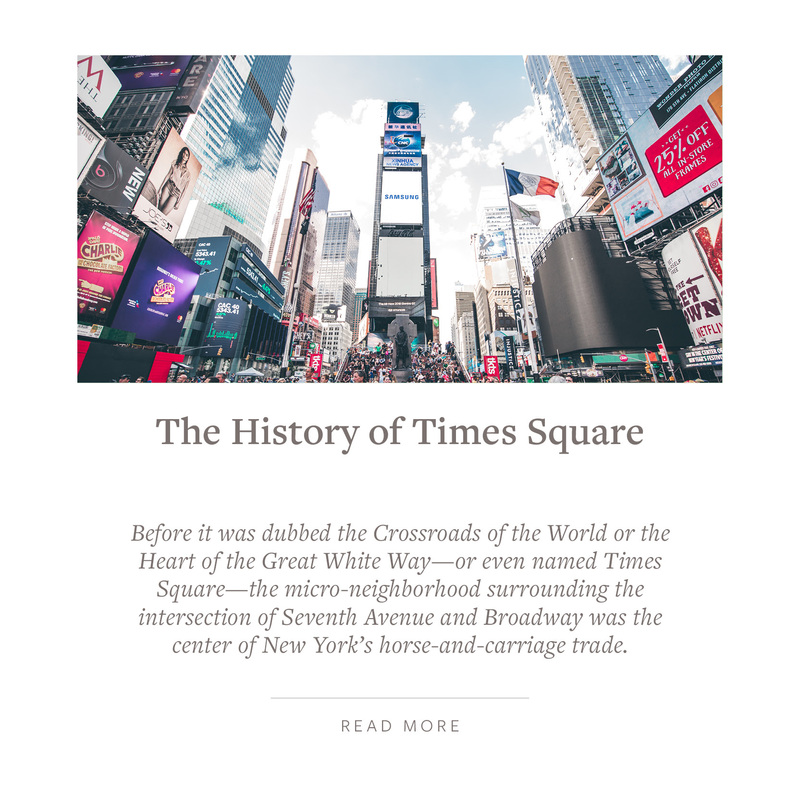 This holiday season, navigate the kaleidoscope of lights and crowds on the streets of Times Square; once known as “Long Acre Square” in 1904 when the IRT subway opened. The Dia Art Foundation reinstalled an art installation by Max Neuhaus entitled “Times Square” created in 1977 and removed in 1992. Listen carefully in the middle of the pedestrian island in Times Square for the harmonious sound or “Hum” bellowing up from beneath the surface. In the subway tunnel at 34th Street on the N/R platform, you will find another musical installation called Reach by Christopher Janney. Take a class at the famous Tannen’s Magic Store on 45 West 34th Street – Suite 608, New York’s oldest operating magic shop. You can usually find a famous magician at the Houdini Museum at 421 7th Avenue. With a guide you can also visit the hidden tunnel connecting the New Yorker Hotel to Penn Station. Follow-up these experiences by dining at Stella 34 and some authentic gelato at the famous Florence-based Gelateria on the 6th floor of Macy’s. For magical holiday shopping not to be missed is the indoor 16th Grand Central Terminal Holiday Fair starting November 13th in Vanderbilt Hall. 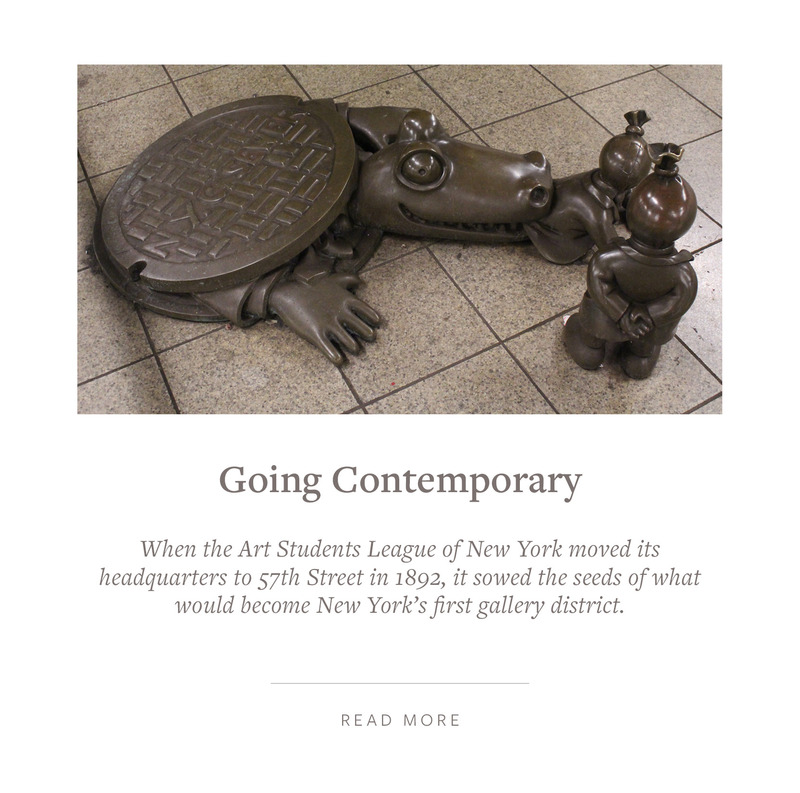 Not far from the famed Grand Central Oyster Bar is an acoustic wonder the Whispering Gallery. Two arched pedestrian tunnels meet at right angles, forming an impervious tiled dome. You can have a private conversation if you and a friend stand diagonally in opposite corners supporting the dome whispering to each other, and will not be heard by others nearby. 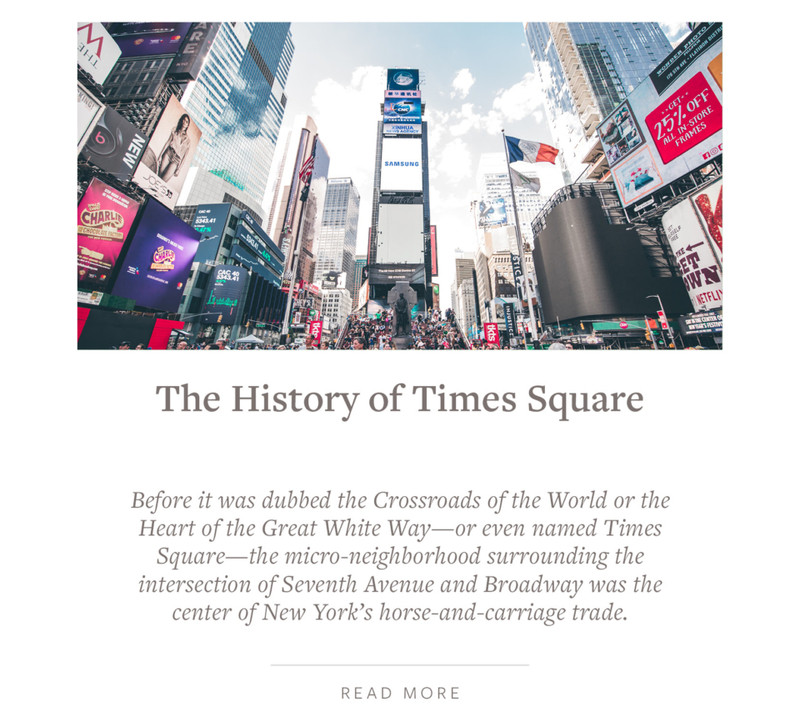 Not far from Grand Central is “Club Row,” once the famed “stable row” where the elite would park their horses and carriages located a block of West 44th between Fifth and Sixth Avenues where you will find the Harvard club, New York Yacht club, The Coffee House Social club, The Lambs club, New York City Bar, The Cornell club, and Penn Club, and literary haunts such at the Algonquin Hotel, The beau arts Mansfield Hotel designed by James Renwick the most famed architect of the day, the Royalton Hotel (bar 44), Iroquois Hotel (Lantern’s Keep bar) and many other Ivy League School clubs are located nearby. 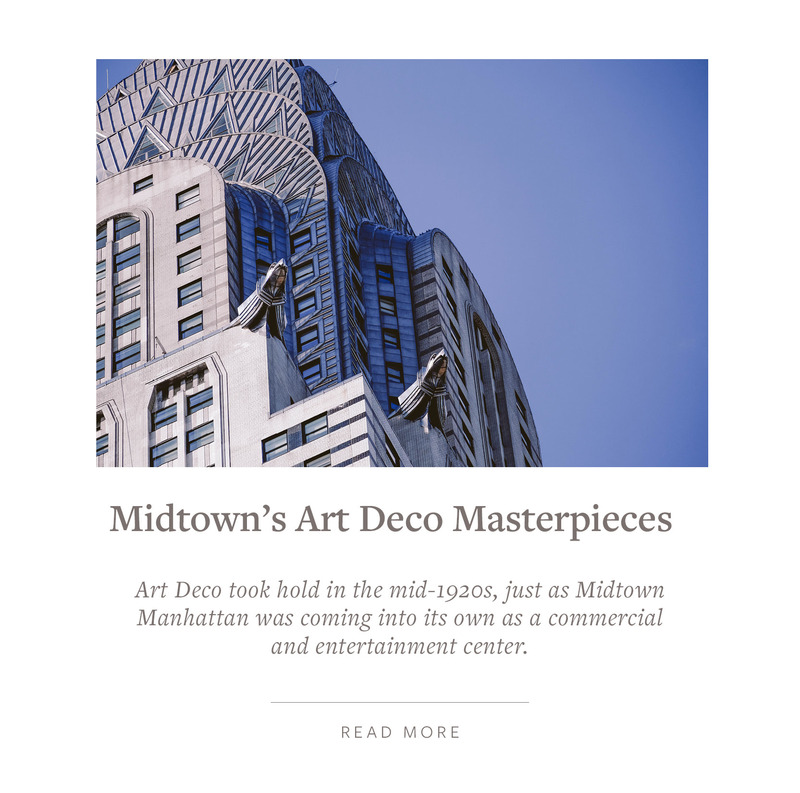 Midtown blends old and new architecture. A slender 63-story building by Foster + Partners modernist architectural building adjacent to Mies van der Rohe’s famed Park Avenue Seagram Building has risen into the Big Apple skyline: One Hundred East Fifty Third Street. The full service condominium building with concierge services, swimming pool, wellness facility, residential lounge, residential library has a total of 94 apartments with a variety of residences: tower homes and loft apartments. Acclaimed Michelin star studded French Chef Joel Robuchon, has leased the first two levels and will operate an exciting new restaurant and bar experience. Pritzker Prize-winning architect Jean Nouvel 53W53rd Street full amenity Condominium has risen next to the Museum of Modern Art and is 82-stories, 139-units that is a piece of art. The apartments are one-to-six-bedroom configurations. 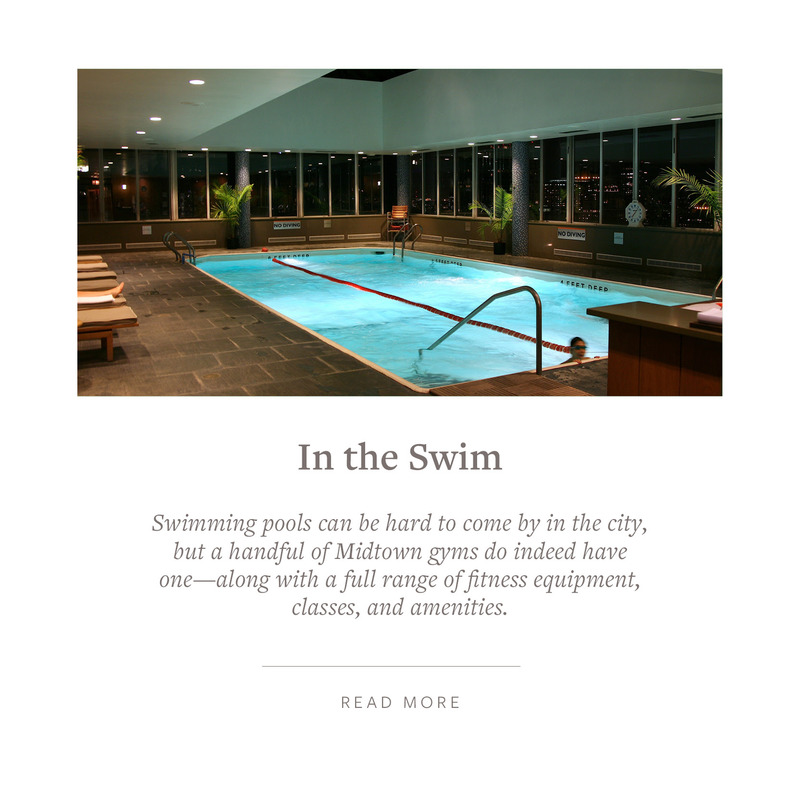 Amenities include a pool, a library, a wine vault, a fitness center and lounge. The Museum of Modern art (MoMA) is also located on the bottom floors of the building. The Halcyon -305 East 51st Street, a 32 story full amenity condominium with 123 residences developed by HFZ Capital Group, Architect SLCE and designed by S. Russell Groves, 432Park Avenue the tallest residential tower in the Western hemisphere, and 252East57th is a curved glass 65-story condominium designed by Skidmore, Owings & Merrill (SOM) and interiors by Daniel Romauladez. 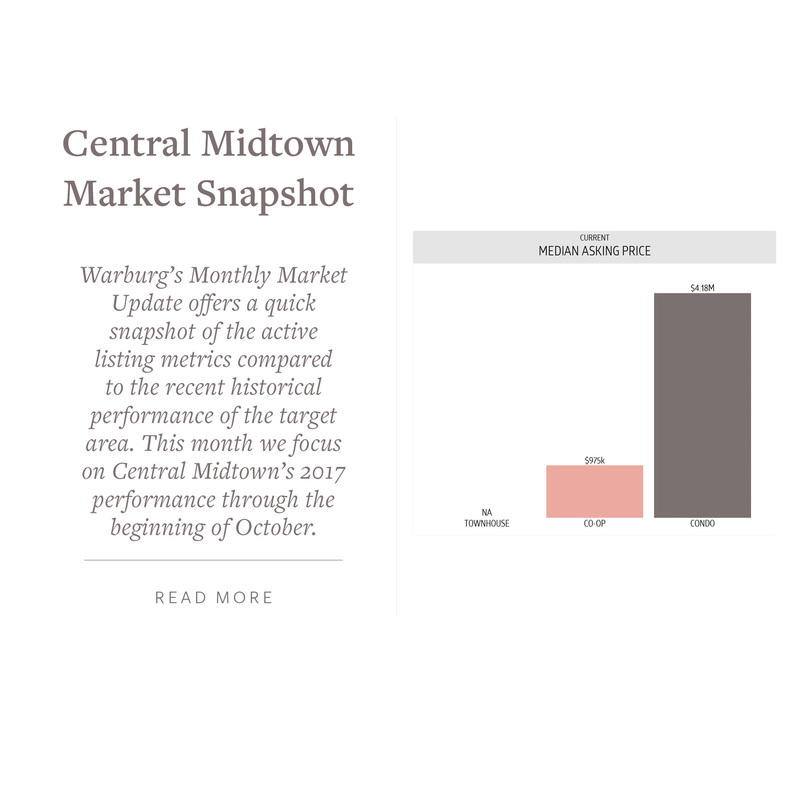 “The tower’s form, inspired by famous vase designed by Alvar Aalto creates unique perspective of the city’s panoramic vistas, including Central Park and East River” were among the developments that had the largest number of luxury sales in 3Q17. Other hidden restaurants to try: El Sabroso on 265 West 37th Street an old loading dock, a tucked-away Latin cuisine lunch counter, when near Carnegie Hall stop in the Burger Joint hidden within Le Parker Meridien hotel -119 West 56th for a delicious burger, fries and shake, the Keen’s Steak House established in 1885 and has a display of clay pipes that were used for “presidents, writers and other-famous celebrities,” The Magic Hour Roof top bar and lounge with an “urban amusement park” concept for adults and epic Empire State Building skyline views, step into Le Colonial a French Colonial South East Asia culinary authentic Vietnamese cuisine, Bar Centrale hidden behind a nondescript townhouse door in the Theater District and the Campbell Bar for a snack & cocktail. 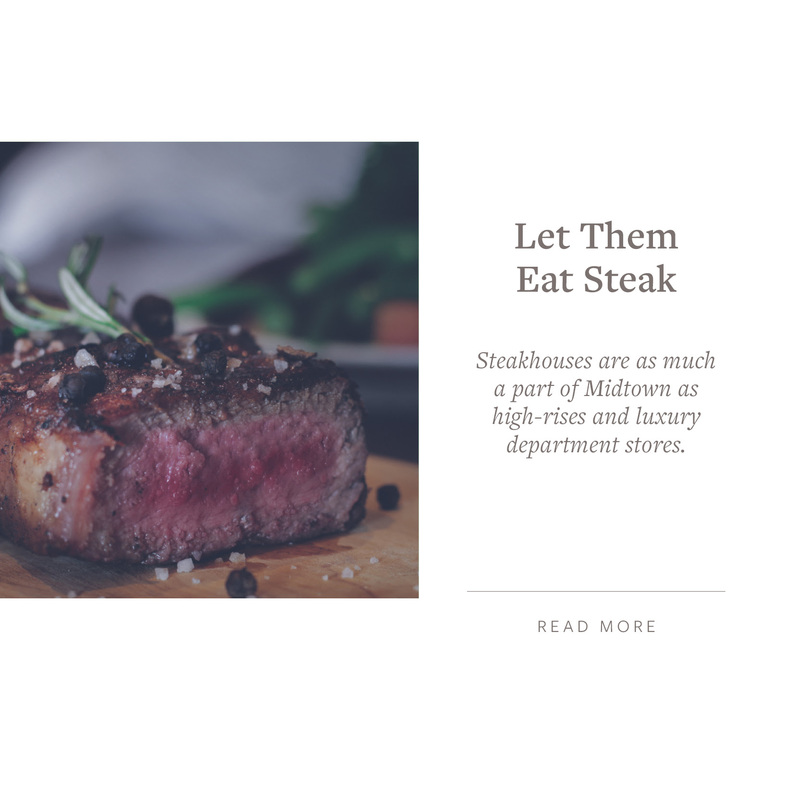 My cousin and I meet each month for lunch at different restaurants surrounding Grand Central and our favorites are STK Steak on 43rd and 6th Avenue and Butter on 45th Street. A Thanksgiving Day tradition for more than 90 years is the Macy’s Thanksgiving Day parade. Thanksgiving is a time for appreciating what we have and giving to those in need. Our prayers are with California, Florida, Texas, Puerto Rico and the many Islands and those that are homeless in our own home town. Thank you for being part of my life’s journey and let me know if I can be of service to you or a loved one their journey.